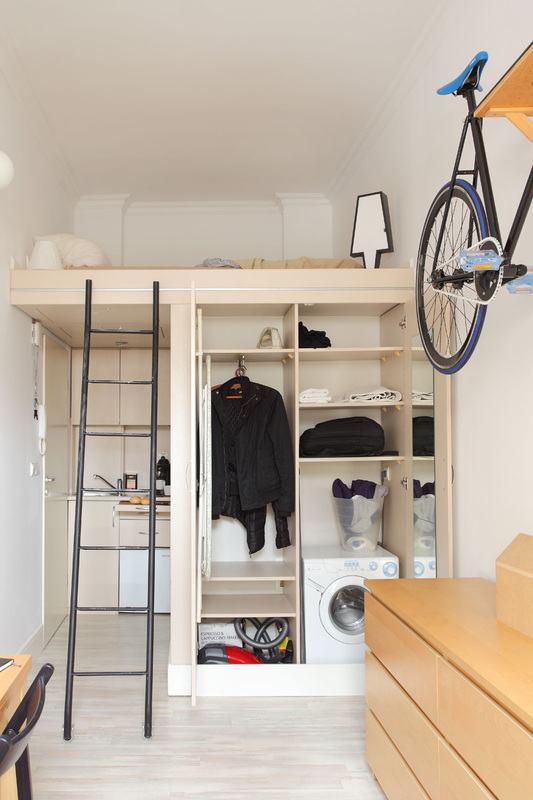 The apartment has only 13 square meter area but it has everything on needs. Most of the time, people would aim for a spacious home because they want everything they need to be in there. But for some, life is actually simpler and less complicated. A small space is already enough in order to contain all the functions they need for a home. I have seen many amazing tiny homes that were actually functional and beautiful. This manifest that you don’t need a large space in order to get a perfect home. Aside from tiny homes, there are urban homes with small spaces that are turned into dwellings. There is even garage or sheds that were turned into lovely home spaces. As a matter of fact, we have showcased them in some posts before. 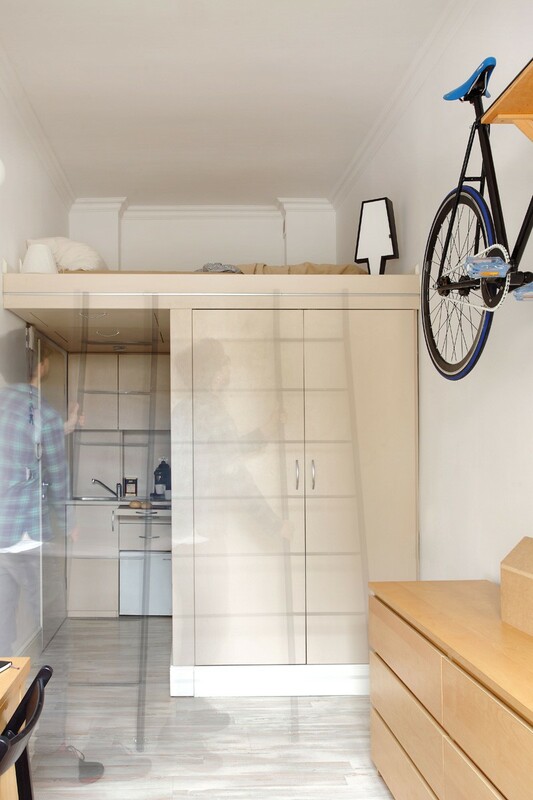 Today, we will show you a tiny apartment that was designed really well that everything the owner needed were all there. 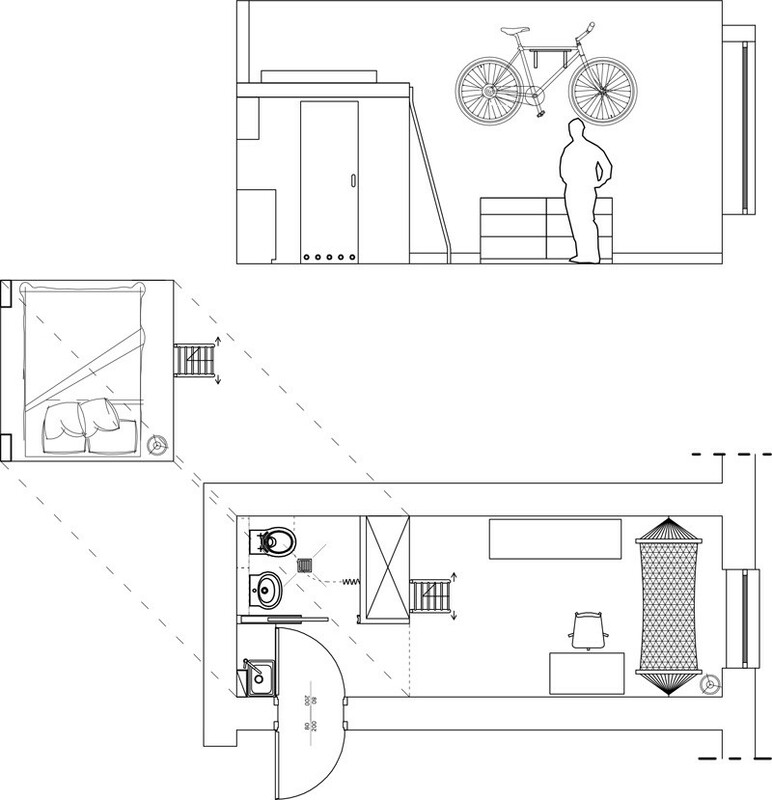 Unique feature: The apartment is only 13 square meters with a kitchenette, a bathroom, bedroom and a bike space. The space as a whole is unique. What made it functional are the proper arrangements in it that allowed fitting a small kitchenette, a bathroom, a bedroom on the mezzanine and even a hammock. It would be nice to relax on this hammock with a view of the sky. 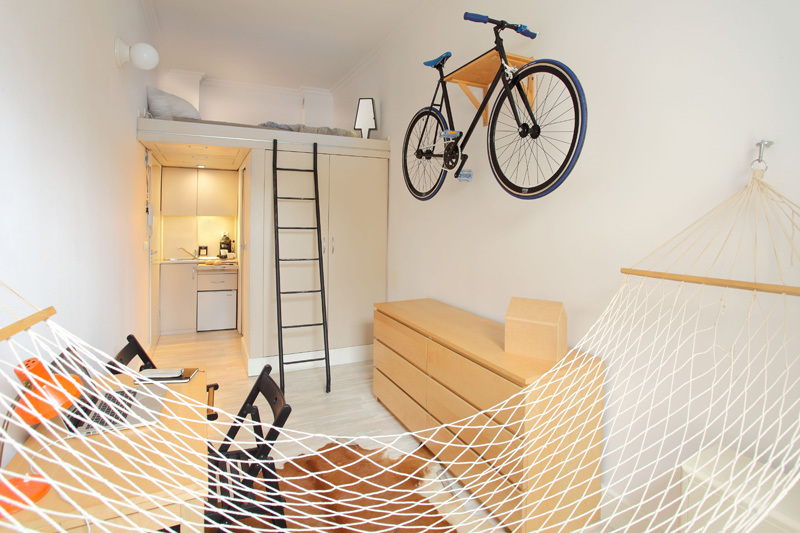 Since the apartment is located in the city and the owner use a bike to roam around, he has a bike space inside it. To make use of the space wisely, a mezzanine was added with a wardrobe cabinet under it, washing machine and a kitchenette. Above it is a space for sleeping. And to access the bed, he needs to use a ladder. Fun, right? 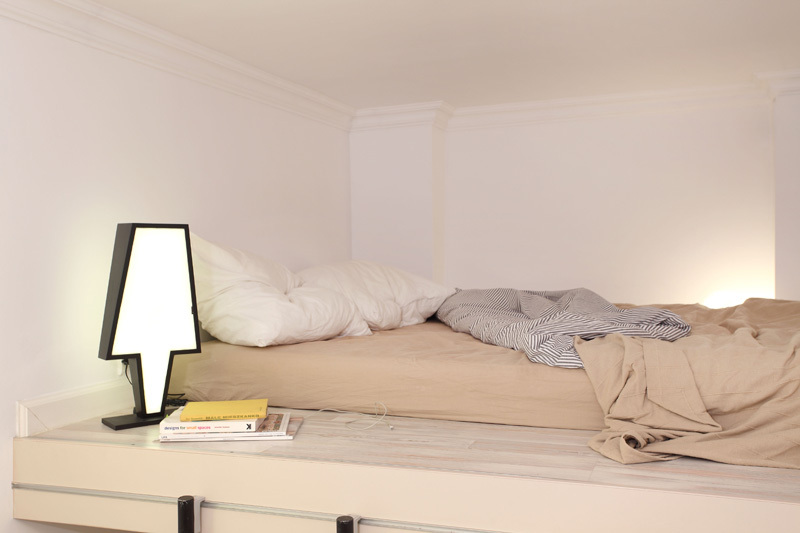 Seen here is the bed with a comfy mattress and a lamp on the side. Even the lamp has a sleek design too that fits the motif of the space. Well, nothing bulky is welcomed for a home this small! Aside from the wardrobe cabinet with clothes and other stuff in it, there is another storage space right under the bed part. Well, for a small home like this, there is indeed a need for storage areas. You can also see here how the ladder can be moved from one spot to another. Everything in the apartment is maintained in bright colors which visually expand the space. 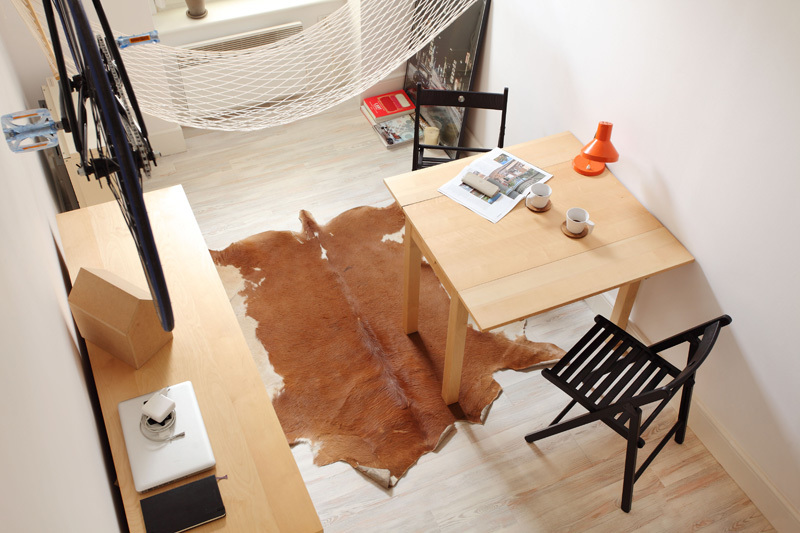 The space has a subtle ‘Young Poland’ style leather carpet placed on the floor to break the minimalism of the area. Every item in the small apartment creates a welcoming, aesthetic and surprisingly functional space. For the kitchen area, everything is well-planned too. Even the chop board can be pulled from the drawer. 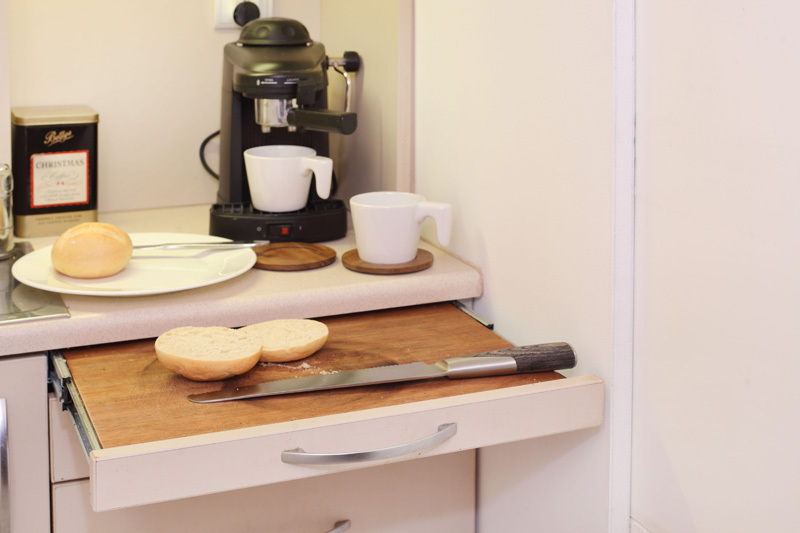 It has a coffee maker too and other kitchen equipment needed to prepare food. In truth, I want a space like this one! You can see here the dining table made from wood that stands opposite a low cabinet which can also be a table aside from being a storage space. And there is a small window right next the hammock. When you are in the hammock, you can see the sky and the scene outdoors. The dining table is also the working table for the owner. Well, with a space this small, you can’t add many tables in it. It is of course practical and a good idea to use the table for many purposes. A folding black wooden chair is a good match to the wooden table. I can tell that this area is very useful for the homeowner. 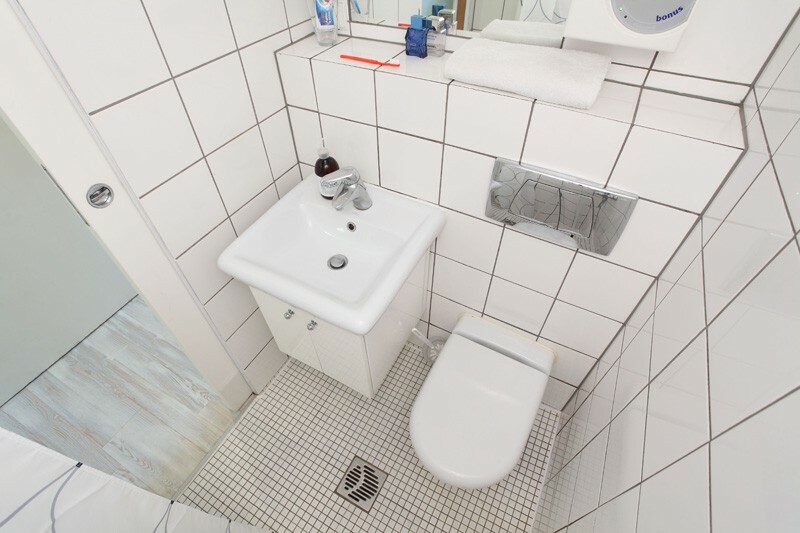 The bathroom is surrounded with white tiles. On the floor are small tiles while larger ones are on the walls. It used a wall-mounted lavatory and toilet to save space. I can see some wall tiles with a different texture too. That adds appeal to the area no matter how small and simple it is Such a small bathroom indeed but I can tell the owner can shower and use it daily without hassle. Seen here is the layout of the apartment. The floor plan is here as well as a cross section. At the back of the mezzanine is the bathroom and kitchen. Imagine how small it is! But yes it has everything the owner needs. In truth, I would love to live in a home as small as this as long as it has everything that I need. What are you going to do with excess stuff and a very spacious home, when this is all you need? I admire the practicality of Szymon Hanczar who did the design of this own space. Designing it on his own will make the home more functional because he knows what he wants and what he needs. I could say that the home is indeed designed well. This shows us that even with a small space, you can put the basic areas of a house and live there comfortably. One advantage here is that you don’t need to clean an entire house. And you can even maintain the cleanliness of the space because it is just this small. Would you live in a home like this? Can you tell me your thoughts about this?